Help, how to topics > Options > Library check in, check out options? 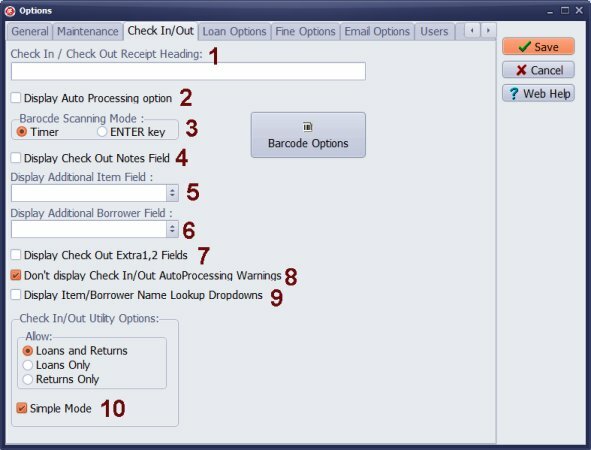 Library check in/out processing options. Display Auto Processing Option (2): check this option to display Auto Processing check box in the transaction window. Use Auto Processing with barcode scanner and item/patron barcodes labels. administrator is allowed to enter any note when processing check out transactions. This note is recorded in the check out transaction. 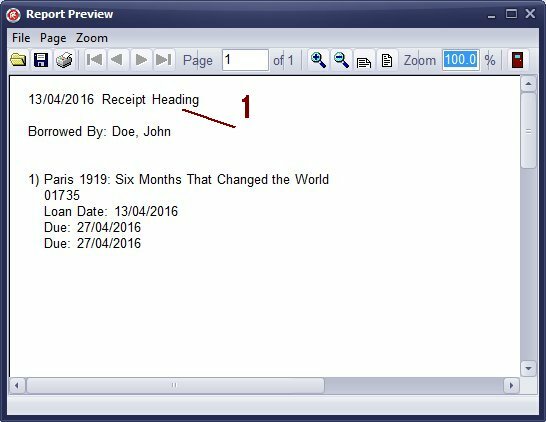 Display Additional Item Field (5): define additional item data field that will be displayed. It is only displayed for the library administrator to verify data. This field is not recorded in the check out transaction. Display Additional Borrower Field (6): define additional patron data field that will be displayed. It is only displayed for the library administrator to verify data. This field is not recorded in the check out transaction. Display Check Out Extra 1, 2 Fields (7): you can display 2 extra fields from the Borrowers database in the check in/out transaction window. Define extra data fields in the loan.map file. The values from the selected fields will be recorded in the check out transaction. Example: you have grade-2 students. You enter teacher name and grade into the student record. You can record the student grade and the teacher name in the loan transaction. Do not display Check In / Auto Processing Warnings (8): use this option when you process check in transaction for many books using barcode scanner. EXTRA1, EXTRA2 are data fields from the Loans table. CUSTOM1, CUSTOM2 are the names of the data fields from the Borrowers table (you can replace CUSTOM1, CUSTOM2 with any field names from the Borrowers table). When check out transaction is executed the program will save the value of the CUSTOM1 in the EXTRA1 and CUSTOM2 in the EXTRA2. 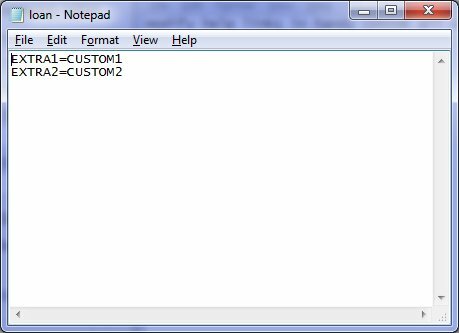 In the above example the Teacher Name is entered into CUSTOM1, the student grade is entered into CUSTOM2. Those values will be stored in EXTRA1 and EXTRA2. I have downloaded the trial version of the software as I am hoping to buy in the next few days, I just want to make sure that it has all the functionality I need. In the version I downloaded there is no space to add notes for checked out items (we need to add in about people sharing books). However when I looked up tutorial videos, that option is there. I am just wondering is it because it is not available in the trial version or why do I not have this option? Answer: In the Check In/Out Options set Display Check Out Notes Field (4). I am a middle school teacher running a small middle school library. I am often not available to check books out for students since I also teach. So students need to be able to easily check books out independently. I have set a 3-book limit for checkout...however when I try checking out more than 3 books, I see a message that says "Max Number of items exceeded! The borrower should return some items first." And then below is the option to override the 3 book limit . Is it possible to make it so that students can NOT override the 3 book limit? Kids taking way too many books is one of the main reasons we are switching to a new library system..so this is very important! Problem 2: When I look at the check out/check in tabs, on the left hand side there is a button that says "return all". But I don't want a kid to click "return" without actually having returned the books...this is why I have volunteer librarians handle all book returns. Is there a way to disable this feature so that kids cant pretend to return a book while actually keeping it? Answer: In the Check In/Out Options use Simple Mode feature (10). Were do we set the default start from Bar code? - set the initial number in the LIB_COPIES box. Is there any way of making Auto Processing ON the default setting in the Checkin and Checkout screens (perhaps in the Options screen). I worry that, should we adopt the program, our volunteer users will scan items in (or out) and forget to click the Check In or Check Out button thus losing the transaction. Clicking in the Auto Processing box doesn't guarantee that the option will be retained until it is un-clicked by the user. Answer: In the Check In/Out Options set Display Auto Processing option. Use sound files for check in and check out transactions. Questions: In all your examples the ID displayed under the barcode is an L followed by six digits. My ID is a one-up counter, and so the number of digits will vary. I want a fixed-width ID so that the barcode width is also consistent. How do I do this? Answer: Click Barcode Options and set the length for your barcodes. Questions: I have the Handy Library Manager software at our library. On our library patrons fields, I have renamed one of the custom fields "Grade." I'm trying to figure out how to print out a list of students by grade with books loaned out, each grade on a new page. What I really want to do is provide a list of checked out books to each teacher. Since I cannot find a way to group students into a class, and we only have one teacher for each grade level, it seemed like this would be an easier way to do it. Answer: Use Display Check Out Extra Field option (7). Modify the loan.map file. 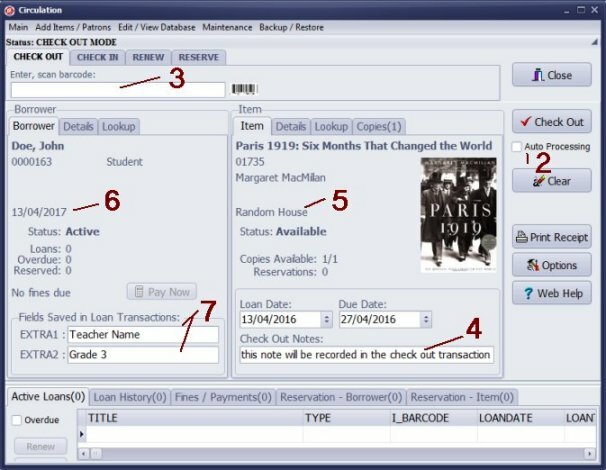 A student will check out an item, from the student record the teacher name will be recorded in the in the loan transaction. With the teacher name in the loan transaction you can create check out items report grouped by teacher.